This online self-paced course will teach you everything you need to know to administer private and public clouds with OpenStack. 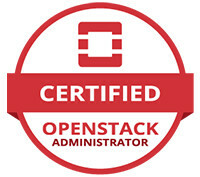 Includes registration for the new Certified OpenStack Administrator (COA) exam, 40-50 hours of coursework and on-demand labs. You’ll learn: The full range of OpenStack services, including deployment, administration, usage and distributed storage. How to deploy multiple distros and provision virtual machines using OpenStack services. How to create and deploy enterprise Infrastructure-as-a-Service. How to run and troubleshoot Neutron, Ceph and Nova Services. And much more! This course is designed to work with a wide range of Linux distributions, so you will be able to apply these concepts regardless of your distro. Featuring On-Demand Labs This course has more than 40 on-demand labs. Whenever you’re ready to take a lab, we’ll spool up your own OpenStack instance so you can practice specific skills in a real environment. These instances can easily be reset and are not shared with anyone else, so you can experiment without worry. Online and Self-Paced This course is completely online and self-paced, so you can take as little or as much time as you need to understand the topics in this class. You also get the same information as our instructor-led LFS452 Essentials of OpenStack Administration course at a fraction of the cost.